For the first time since the launch of the Apple iPhone 5 last September, Samsung outsold Apple in the U.S. during a month. Based on the monthly store surveys conducted by Canaccord Genuity analyst Michael Walkley, the Korean based manufacturer outsold Apple during May thanks to the formidable combination of the Samsung Galaxy S4, Samsung Galaxy S III and the Samsung GALAXY Note II. 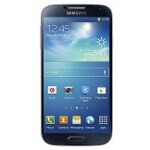 In addition, the Samsung Galaxy S4 is the top selling smartphone at three of the nation's four top carriers. At Verizon, Sprint and T-Mobile, the latest Android flagship model was on top of the sales charts followed by the Apple iPhone 5. 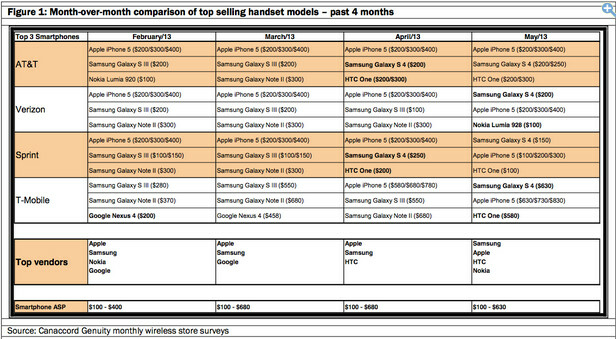 Only at AT&T was Apple's iconic smartphone on top with the Samsung Galaxy S4 trailing. But the iPhone has a long history at AT&T as the device was originally an exclusive at the carrier in the U.S. for a few years. The HTC One was third at AT&T, Sprint and T-Mobile. With the phone not due at Verizon until later this summer, the recently launched Nokia Lumia 928 came in third at Big Red. This was the first appearance of a Windows Phone model in the investment house's sales charts in two months. The galaxy s line has reached iphone status, incredible. HAters, gag on it real slow! S4 alone outsold iphone 5 so how can u say 3 products are required to outsell 1. If you combine all 3 worldwide then its much much better. Technically, Apple is currently selling 3 models of the iPhone as well in the US: iPhone 5 ($199), iPhone 4S ($99), and iPhone 4 (99 cents or free), contract prices as shown. Hate on it for what? It's a great device. The key way to truly selling a smartphone is not to make carrier exclusives and release on top six carriers (1.Verizon,2.AT&T,3.Sprint,4.T-Mobile,5.Leap Wireless/Metro PCS and 6.US Cellular.) That's why this phone is selling so well. I guess "plastic" is ok with a LOT of people after all. Samsung is literally flooding the market with it, and it keeps selling. from what I hear, Sammy is moving away from plastic after the Note 3. now you have the S4 active and the S4 mini to go along with the still popular S2, S3, Note 2 and the aforementioned, highly anticipated Note 3. this is a smartphone lineup that no other smartphone company can possibly compete with. sorry HTC, too little, too late. And the HTC ONE is still #1 on Phone Dog since Feb by USERS and the EXPERTS! GO HTC!! even if 10000 people voted on it that isn't a good idea of how popular a phone is. You could go get 10000 hipsters and most of them would answer iphone 5. You cannot use the comments on phonedog or phonearena as to what everybody is doing. The blackberry Z10 was #1for almost a month which was a flat out joke. Then you see plenty of pro windows phone/Nokia comments on this site to make you think that their in first place. And don't get me started on the cheap plastic design of the S4 vs metal on the HTC One debates. The comments on this site represent maybe 0.1% of the total number of individuals buying phones. Do you really think a phonedog poll is a true indicator how a product is doing? It's only a tool used to see how hard you can pump your chest up. Wheres the i spin off commercials for I'm a Mac/ I'm a PC. With I'm and Android/ I'm an iphone. the S4 is definitely not ugly, my gf even said the white S4 was very pretty and preferred it over the XZ design. Whats good about the removable back cover is that you can replace it with aluminium back cover, or other plastic, wood cover which in my opinion, is alot better than non removable device like HTC or XZ. If the S4, S3 were ugly phones, why do alot of people buy it? Marketing can only do so much, but if someone finds a design ugly, they wont buy it. I have heard plenty of people say that it is pretty. Just tech geeks think it is ugly if it doesn't look like something out of robotech or star trek or if it doesn't look a race car or rice rocket. They fail to see the beauty in minimalist elegance. Yeah I like the s4 design much more than the s3. It's much more modest with reduced eccentric curviness. The metal band around the edge gives it a nice premium-er touch too. In the end, the plastic does feel a bit funny and is prone to some major sliding around, but for me that's a small price to pay for open access to an SD card slot and battery. Because that's the only thing they(haters or geeks) can say something against Galaxy S4....or they also say things like "I don't like so many features on GS4" What a joke. It's like saying "I don't like options and choices"
Not bad Sammy and mind you this is in the U.S where everyone's got an iPhone (at least that's what I see on TV :P) meaning if you take the rest of the world into account, you'd get a better figure. I don't think I'd change the back cover though, the plastic is pretty flexible and durable for continues used but that's just me. Lumia 928 climbing up the Verizon charts eh? Good for Nokia. The real test will be when they start selling the One.